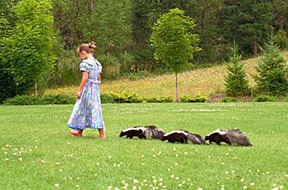 Years ago I took this photo of my daughter and some orphaned baby skunks that we raised and released to the wild. As a veterinarian I have worked with a wide variety of animal species, including rescuing and rehabilitating orphaned or injured wildlife. Skunks are among my veryfavorite animals. That is why I am writing a book about skunks and have made greeting cards from my photos of them. Skunks are active at night and beneficial for farms and gardens because they eat insects, grubs, and small rodents. Although notorious for their defense mechanism—the ability to spray a foul-smelling musk when threatened or harmed—skunks are usually reluctant to spray unless seriously provoked. Instead, they try to bluff their way through dangerous encounters by stomping their front feet, holding their tails straight up in the air, and doing handstands in an effort to scare away their aggressors. Skunks are often misunderstood and maligned. In reality, skunks are beautiful, unassuming, gentle animals that don’t deserve their stinking reputation! I hope my book will give readers an appreciation for this soft, shy, little animal that shares our corner of the world.